Barnett Fine Art is proud to participate in a fundraiser for a Temple Sisterhood in New Orleans, Louisiana. 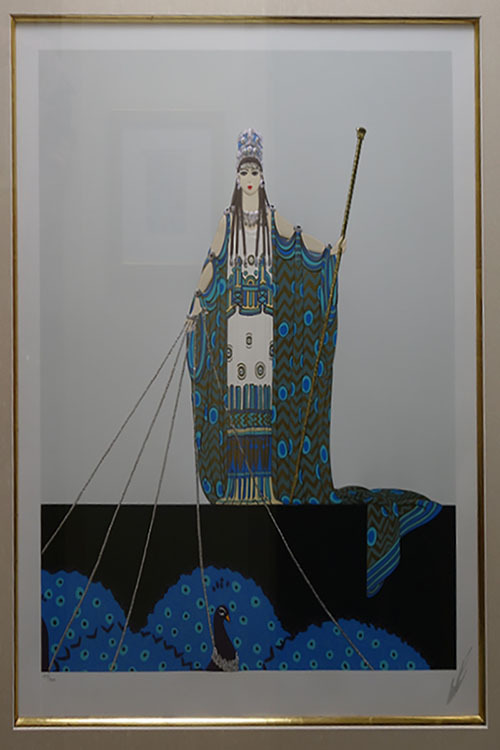 The Sisterhood received a gift of the Erte “Hera and Zeus Suite” which consists of two serigraphs “Hera” and “Zeus” both described below. The Sisterhood is an active group in the Temple working to further and enhance the interests of the congregation. The Sisterhood promotes Temple attendance, friendships and fellowship of all members. The group develops and sponsors religious and educational programs and encourages religion in the home. Other activities include participation and support of causes for women and children throughout the community, including the local Ronald McDonald House and the Jewish facility for the aged. The Sisterhood gives scholarships for training of rabbis and to children to attend religious summer camp. Funds raised from the sale of the Erte Suite will be used for special projects. This mint condition serigraph by Erté is embossed in both gold and silver foil and beautifully framed. The work depicts the mythological Greek god Zeus holding his iconic lightning bolts. 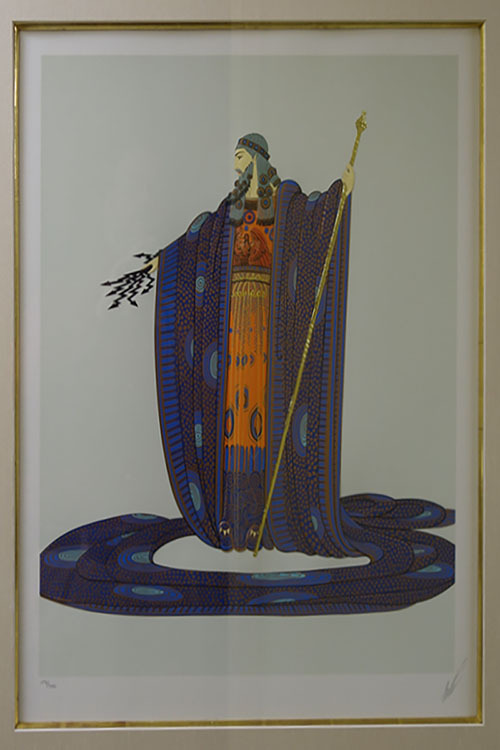 The clean, flowing lines and curves of Zeus and his robes are a wonderful example of Erté’s signature Art Deco style. This mint condition companion serigraph is also embossed in both gold and silver foil and beautifully framed. The work depicts Hera, the mythological wife of the Greek god Zeus, with the peacocks that pulled her chariot. Flowing lines and crisp curves wonderfully depict the signature Art Deco style of Erté. While the Sisterhood prefers that the work is sold as a Suite, the serigraphs may be purchased individually. This is an extraordinary chance to add some exceptional Art Deco work to your collection! Purchase these valuable works for an incredible price while also supporting a highly respected religious congregation. This entry was posted on Friday, August 26th, 2016	at 3:03 pm	and is filed under Art For Your Collection	. Both comments and pings are currently closed.